Introduction. 1. The Essex Rising of 1601. 2. Justifying War. 3. 'Profane pollicy'? Religion, Toleration, and the Politics of Succession. 4. 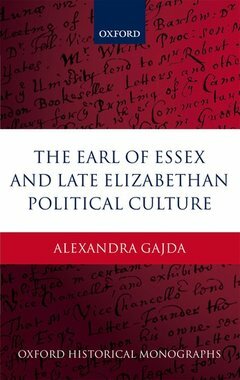 Physician of the State: Essex and the Elizabethan Polity. 5. The Popular Traitor: Responses to Essex. 6. Scholars and Martialists: The Politics of History and Scholarship. Conclusion. Bibliography. Alexandra Gajda was a student at New College, Oxford University. After the completion of her doctorate in 2005 she was appointed Fulford Junior Research Fellow at St Anne's College, Oxford, and in 2006 was awarded the Institute of Historical Research Sir John Neale Prize for Tudor History. She has been Lecturer in early modern British History at the University of Birmingham since 2007.